One of my favorite braiding techniques has to be the waterfall braid. This technique combines the beautiful art of French braiding, but releases the lower strand of hair as you go along, letting it hang freely and loosely, giving it a much more casual look. 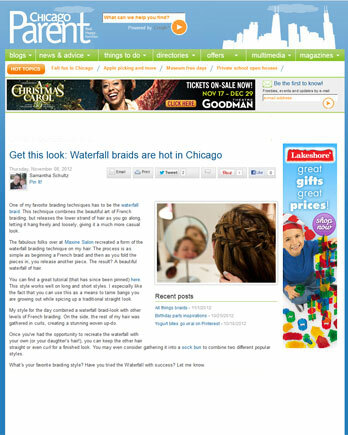 The fabulous folks over at Maxine Salon recreated a form of the waterfall braiding technique on my hair. The process is as simple as beginning a French braid and then as you fold the pieces in, you release another piece. The result? A beautiful waterfall of hair. You can find a great tutorial (that has since been pinned) here. This style works well on long and short styles. I especially like the fact that you can use this as a means to tame bangs you are growing out while spicing up a traditional straight look. My style for the day combined a waterfall braid-look with other levels of French braiding. On the side, the rest of my hair was gathered in curls, creating a stunning woven up-do. Once you've had the opportunity to recreate the waterfall with your own (or your daughter's hair! ), you can keep the other hair straight or even curl for a finished look. You may even consider gathering it into a sock bun to combine two different popular styles. What's your favorite braiding style? Have you tried the Waterfall with success? Let me know.